Carl Sandburg, esteemed American writer, is credited with coining the nickname “City of the Big Shoulders,” and while he probably wasn’t referring to the suits of the day (he was in fact praising Chicago’s industrial prowess at the turn of the 20th century), it wouldn’t be much of a stretch to think he was. Our Chicago suit, like the city, is comfortable and built for about any body. While it would be a misnomer to say the jacket has “Big Shoulders,” we can confidently say that our Chicago model can fit those shoulders. With the point-to-point measurement (suit speak for shoulder width) at 19” on the base model, it’s a relaxed and accommodating fit. The extra room bodes especially well for those who are naturally built thicker through the chest and back, spend ample time in the gym, or for the guy who doesn’t want to feel the jacket when he’s wearing it. Whatever the case, the lack of padding and carefully crafted canvas interfacing provides shape and structure without the weight and thickness of a cheaply made suit. Moving South on the jacket, the waist line gently suppresses to the 6” standard drop embraced by the suit making industry. This differs greatly from suits of the past (ourselves included) that were cut in the “sack” manner, meaning a boxy fit. This look, rampant in the 1980’s and into the next decade, has all but been abandoned by most for a more flattering fit. Other stylistic updates include a slightly retooled lapel, featuring a higher gorge line and revised lapel width. The lapel width, sitting at 3 1/4,” is a perfect update to the exaggerated widths of yesterday without being on the bandwagon of the narrow lapel fashion suits of today. It’s the perfect width for the cut of the jacket, keeping all aspects in balance. 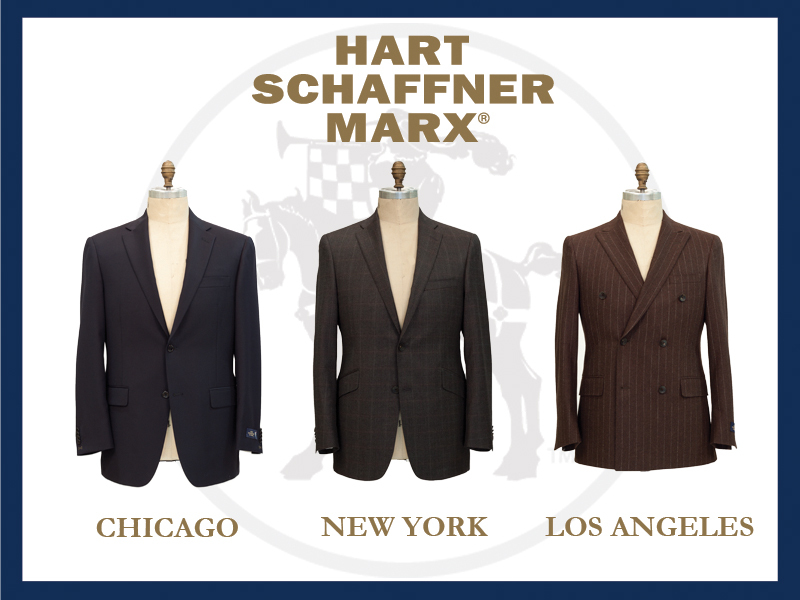 Still echoing the city, the Hart Schaffner Marx Chicago suit can fit any person, taste or style; the pants are no different. It doesn’t matter if you’re a traditionalist or more modern, we offer options for pants that satisfy either taste. Current trends have placed flat front in the spot light. We recognize the shift in preferences, but also respect the gentlemen who demand a more classic look. That is why the Chicago is available as a flat front as well as a double reverse pleat pant. And for the man in between classic and modern, we also carry a single reverse pleat option to help smooth the transition. Above you’ll see a comparison of our three main bodies for the Fall 2013 season. While they’re all a Hart Schaffner Marx suit, you’ll see they each encompass a different set of values. Differences in the shoulders, waist suppression, and length are the most obvious visual cues, but there is more to fit than meets the eye. The Chicago body, shown far left, is an easy-fitting suit for the man looking for comfort and longevity. While traditional in fit, the styling of the garment reflects the change in times with subtle updates. The lapel width, gorge height, and jacket length have all been carefully considered, ensuring a look that won’t look dated after a couple seasons of wear. The New York body, shown center, carries a fair amount of updates, all done quite discriminately, but without a hint of garishness. A higher armhole & slimmer sleeve highlight the increase in waist suppression, while the slightly shorter length and narrower shoulder are contemporary without being fashion forward. Its made for the man who is always on time, and this suit speaks to that. The Los Angeles model, shown far right, challenges the notions of how a Hart Schaffner Marx suit ought to look and fit. Following current fashion trends, the LA is a full inch and a half shorter than its Chicago predecessor, and its body-contouring lines are far more physical in nature than the New York. Unlike other slim cut and fashion suits, the LA is constructed with the same quality and know-how of what one would expect from a traditional tailor, except this is nothing you’d ever expect to find from a traditional maker. And we’re quite pleased with that. Following posts will consider each model in much greater detail. 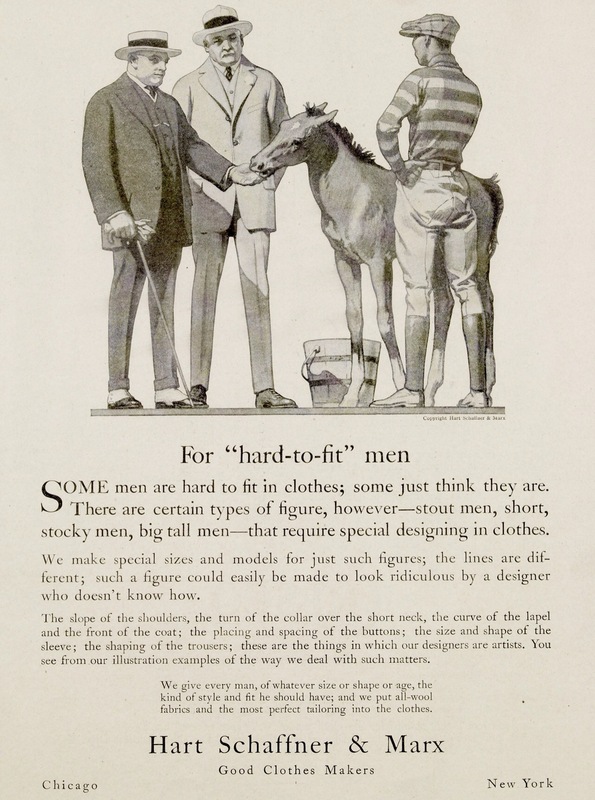 Hart Schaffner & Marx was the first company to recognize that while “all men are created equal,” they don’t fit into their clothing the same way. 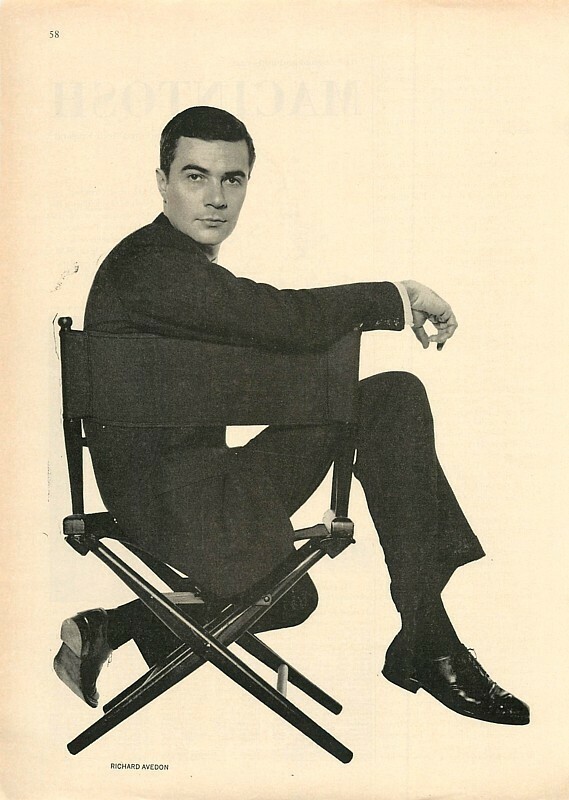 With an uncanny understanding of the wants of their customer, the Chicago-based company introduced the first proportioned suits on the market, offering a variety of ‘basic body’ types that recognized the individuality of the wearer. “Tall, Short, Stout, and Thin” fit suits joined the ranks of the undiscerning singular fit that crowded the sales floors across the country. The innovation was well received at the time, and the foresight is evident given its a practice that still dominates the market place more than 100 years later. Today, more than ever, we understand that same sentiment Joseph, Harry, and Max had: men are different. Today we recognize that men vary in more than just their physical size and shape, they differ (perhaps more importantly) in their motives for dressing well to begin with; not all men wear their clothing the same way, nor for the same reasons. Men rightfully demand more out of their clothing today. Just as we did in 1906, we feel compelled to meet those demands. While a long time in the making, we came to the precipice of this conclusion during 2012, the year of our 125th anniversary. Focusing not only on what we perceived to be the strengths of our previous collections, we gathered feedback from retailers and consumers alike on what we could improve. We learned much and acted upon it. We focused on a contemporary look without abandoning the DNA of the brand, nor the comfort, softness, and balance Hart Schaffner & Marx has developed over the decades.In some instances we offered only minor tweaking, primarily on established garments in an effort to evolve with the times. However, the bulk of our efforts were spent on thoroughly updating product to meet this new standard, and in an unlikely move, we created an entirely new model in an effort to push ourselves ahead of the times. In addition to the basic body types we developed, those that became the industry standard at the turn of the 20th century, we continue our legacy of innovation and introduce our 3 latest models for 2013: The Chicago, New York, and Los Angeles. Each model, much like their namesake cities, continues to evolve with their own distinct personality. The silhouettes not only accommodate the wearer’s body, but fits his renewed attitude towards what he wears. How Much Can You Alter Our Garments? 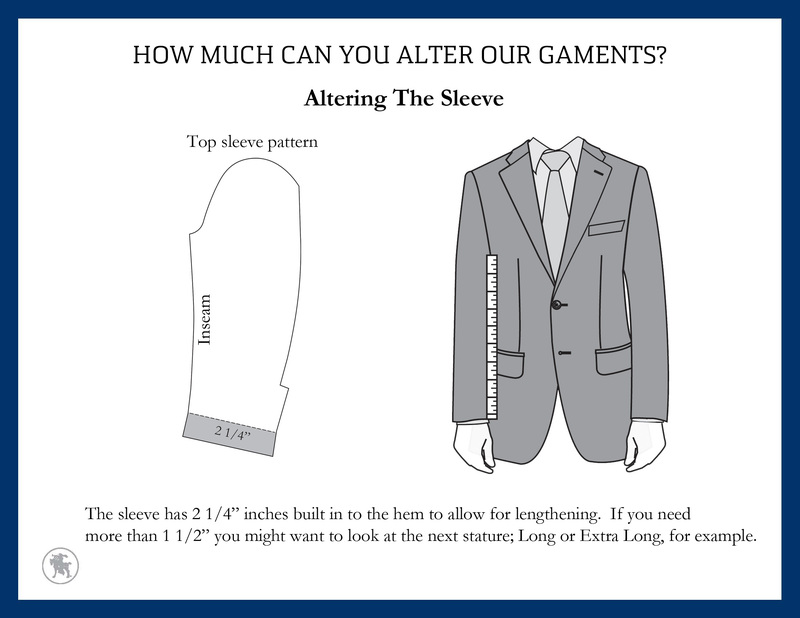 In a previous post we showed some of the typical points of measurement used by the tailored clothing industry. While we attempt to create sizing options based on extensive studies of anthropometric data, the reality is that no two bodies are alike and sometimes alterations are necessary to make a ready-made garment fit better. In the next series of posts we will show what allowances have been built in to every Hart Schaffner Marx suit to allow for these alterations. The first is the sleeve length. Our head technical designer Jeffery Diduch is a truly impressive tailor. On his blog Made By Hand, Mr. Diduch discusses what he calls “the great sartorial debate,” inspecting bespoke and made to measure suits, sometimes dissecting them and sometimes going into detailed instructions on how to complete certain stitches. 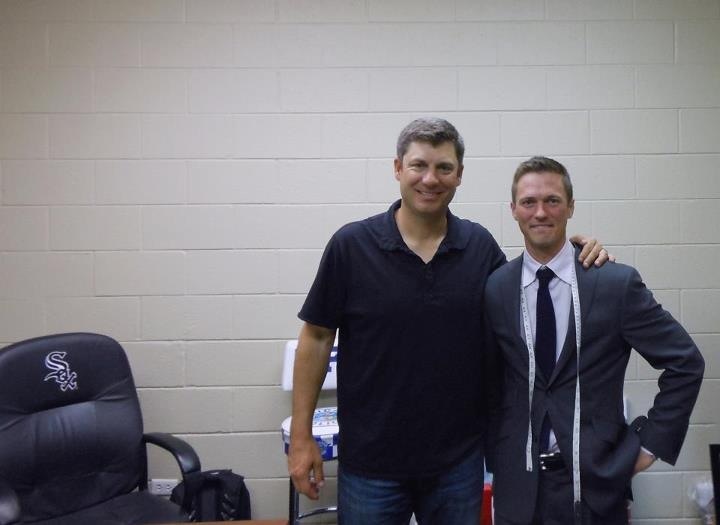 Rob Ventura, manager of the Chicago White Sox, and Jeffery doing a team fitting for their Hart Schaffner Marx suits. Mr. Diduch was “discovered” for his tailoring skills while making a suit for himself to wear for a meeting, as we learned on a feature interview with him on the Gentleman’s Gazette. GG: What are the most important aspects in a suit for you? Shoulders, pattern, handwork…? 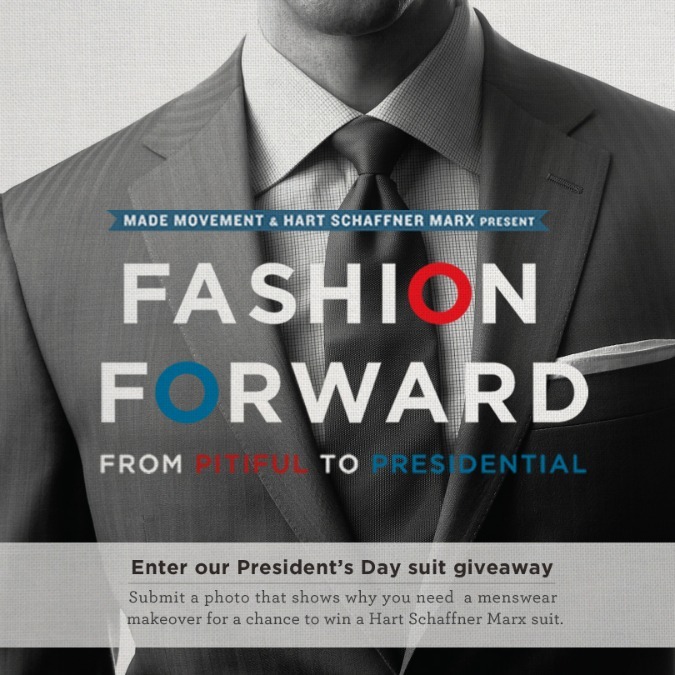 What better way to honor Presidents past than by winning a suit made by the current Chief of State’s preferred brand? Made Movement (who’s flash sale site MadeCollection.com we wrote about in November) is giving you the chance to do just that. Submit a photo that shows why you need a menswear makeover, along with a quick caption to campaign for their vote. The winner will receive a wardrobe consultation and an American-made suit from Hart Schaffner Marx, manufacturers of luxury tailored clothing and sportswear since 1887. You have until March 1st, so get on it! Enter here.